UCLA Extension is one of the nation’s oldest, largest, and most comprehensive continuing higher education providers. In 2012 Pomp Productions was selected by the school to provide research and evaluation of premium WordPress themes which could be customized for use across their many department websites. After thorough vetting, three themes were selected and working closely with UCLA Extension staff, we incorporated the school’s brand identity into each. We developed custom functionality to extend the WordPress CMS. Intuitive control panels provide full control of the UCLA Extension brand elements as well as the ability to easily enable the appropriate logos, web fonts and color palettes. Backend development and technical support included theme installation and migrating content from previous department websites to a new hosting solution with subdomains for each department. The combination of WordPress and customized themes provides a modern, responsive HTML5 solution which works across all platforms. 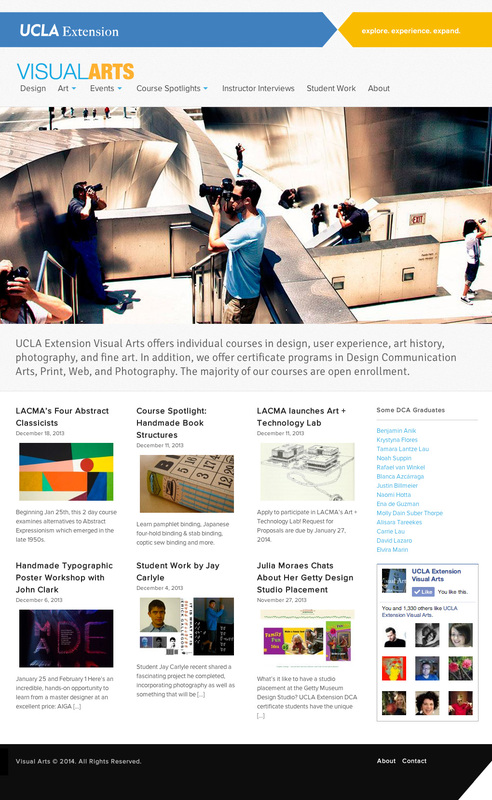 Finally each department has the ability to select their desired theme and seamlessly adjust the look and feel of their website while maintaining the UCLA Extension’s brand identity.